An earlier post addressed the question of when to write Gospel and when gospel; this post deals with a similar issue: when one should write Epistle and when epistle. The same principles discussed here will apply to the synonyms Letter and letter. SBLHS §4.3.6 offers seven examples of when Epistle or Epistles is to be capitalized; no examples of the lowercase form of the word are provided. This post will confirm some of the examples given above but correct several others, all according to the principles set forth in the earlier post on Gospel/gospel. 2.1. In keeping with standard English-language practices, we capitalize proper nouns (e.g., Catholic Epistles). 2.2. In general, we prefer a down style, that is, the use of fewer initial capital letters (§4.3.2.3). We do not capitalize terms out of reverence or because of tradition. 2.3. To the extent possible, a preference for consistency leads us to format similar types of terms in analogous ways. 2.4. In some cases, a desire for clarity may incline a writer to choose one formatting style (e.g., initial capitalization) over another. 2.5. If a writer or copyeditor cannot decide on the proper formatting, it may be best simply to revise the problematic phrasing. The following examples illustrate how these principles can be applied individually and in tandem. 3.1. Commonly used titles of books are always capitalized. However, one should ask if the use of a full title is essential for clarity or is unnecessarily formal (see §4 below). 3.2. 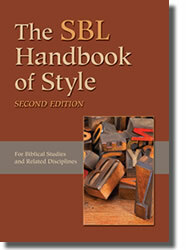 SBL Press regards certain terms as proper nouns in all instances. The examples listed below are not canonical divisions but terms of convenience with a single definite referent. Just as we would capitalize Bill of Rights within a US constitutional context, we capitalize Catholic Epistles within a New Testament context. 3.3. Contra SBLHS §4.3.6, we do not capitalize the following terms, since they do not designate a canonical division per se. 3.4. In keeping with §2.2 above, these and similar general phrases are set lowercase. This letter is the earliest of Paul’s known writings. Jude’s letter apparently draws upon prior tradition, including 1 Enoch. SBLHS §4.3.4.1 states: “It is usually preferable to avoid designations like book, letter, and epistle when referring to the titles of biblical writings (e.g., Psalms is better than book of Psalms, and James than Epistle of James).” Writers who wish to communicate clearly and concisely will avoid wordiness, stilted language, and the unnecessary clutter sometimes created by overcapitalization.